Nothing hits the proverbial spot quite like a large pot of stew on a cold winter day. For today’s Holiday Recipe Exchange, I thought I would share my delicious for Beef Stew. Trust me; comfort food doesn’t get any better than this! I am really thrilled about this theme because I love to cook hearty soups, stews, casseroles in the winter months and I am a HUGE fan of Le Creuset. If you don’t own a Le Creuset French Oven, it’s definitely one of those kitchen essentials you should start saving for. Not only are they stunningly beautiful, but they’re made from enameled cast iron, which distributes heat slowly and evenly. After I received my first French Oven, I was smitten and continue to grow my collection; which I display on a shelving unit in my kitchen. Seriously, they are that pretty to look at! 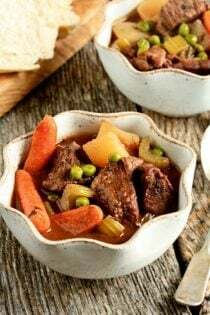 This beef stew recipe is simple to prepare, but makes such an amazingly rich and comforting dinner that people will think you stood over the stove all afternoon making it. Don’t be intimidated by the length of the ingredients list, I’m betting you already have most of the items in your pantry and fridge! 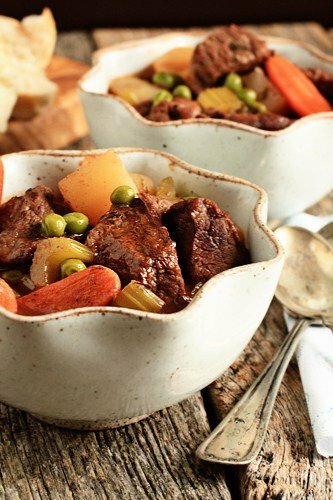 I truly hope that you and your family enjoy cozying up with a piping hot bowl of this beef stew. Serve it up with a fresh baked loaf of bread from the market and dinner couldn’t be any heartier or delicious! 1. Combine flour, garlic and onion powders into a bowl; mix until incorporated. Toss beef into the flour mixture until thoroughly coated. 2. In a large dutch oven, cook beef in heated oil over medium heat until nicely browned. Remove beef and set aside. 3. Deglaze pot with red wine, scraping up the brown bits from the bottom of the pot. Dissolve bouillon in water and pour into pot. Add in beef, rosemary, parsley and pepper. Bring to a boil, then reduce heat, cover and simmer 1 hour. 4. Stir potatoes, carrots, celery, onion, Worcestershire, ketchup and A-1 Steak Sauce into the pot. Dissolve cornstarch in 2 teaspoons cold water and stir into stew. Cover and simmer 1 hour more. Stir in frozen peas and continue cooking until peas are cooked through. Add salt to taste.